Here’s another synthesis of Ebola science news from the couple of weeks. If you’re interested in slightly older material, there’s lots on past papers and news in the six preceding posts – links at the bottom of this post. I’m reorganizing this section going forwards, to drop the part on ‘data quality’ – it’s getting boring to say “it’s not good, and probably getting worse” – and the modelling part on epidemic trajectory – a corollary of the data quality. One thing I will note here though, is how easy it is to misunderstand the role of “curve fitting” early in an epidemic. There was a news piece in Nature last week entitled “Models overestimate Ebola cases“. I imagine that this was written to be provocative, but as many commenters noted on twitter (sorry, I don’t have specific tweets to hand), this is more a statement of fact than of surprise. These efforts aim to estimate disease parameters, and to give some idea about a worst-case scenario. They can never predict when the exponential rise in cases is going to occur, and aren’t aiming to do so. Some commenters on the Nature post brought up the George Box quote: “all models are wrong, but some are useful“. But I would argue that in this case the models were right – they got us to things like the true R0 or CFR – but people were looking to them to provide answers to questions that were not being asked, and could not be answered, by these tools. As a new cluster of cases emerges in Mali, the epidemic situation in Liberia may be diverging somewhat from Sierra Leone and Guinea. The initial reports of empty ETC beds have continued, at least in some parts of Liberia, and consideration is now turning from stopping runaway growth to putting out flare-ups as they arise. The news reports are now bolstered by reports from the field in both Lofa and Montserrado counties that reported cases, hospital admissions and positive tests are all on a downward trajectory. However, this doesn’t rule out citizens deciding to distance themselves from treatment units, and the decline appears to have stalled this week. I think we need more information, preferably from those on the ground, before we can reach conclusions on where Liberia’s epidemic is going. In Sierra Leone, in contrast, reported cases have been at or near record levels in the past two weeks. While control measures appear to have had an impact in the north-east (Kenema and Kailahun) where Ebola first reached SL, it remains considerable in and around Freetown, and has made serious inroads into the previously (officially) unaffected Koinadugu. Cases in Guinea are not rising rapidly, but incident numbers continue at approximately the same level as in recent weeks. I would also highlight that the WHO SitRep page is much improved, having shifted from pdfs to a webpage for each report, making it considerably easier to read and digest the information they provide. 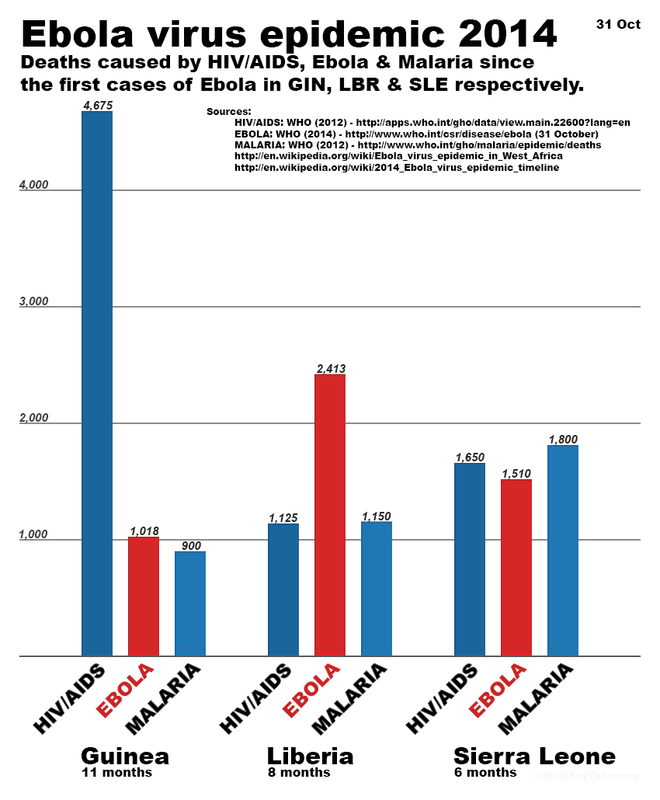 Finally, way back in September we were discussing how serious Ebola was, compared to other causes of mortality. 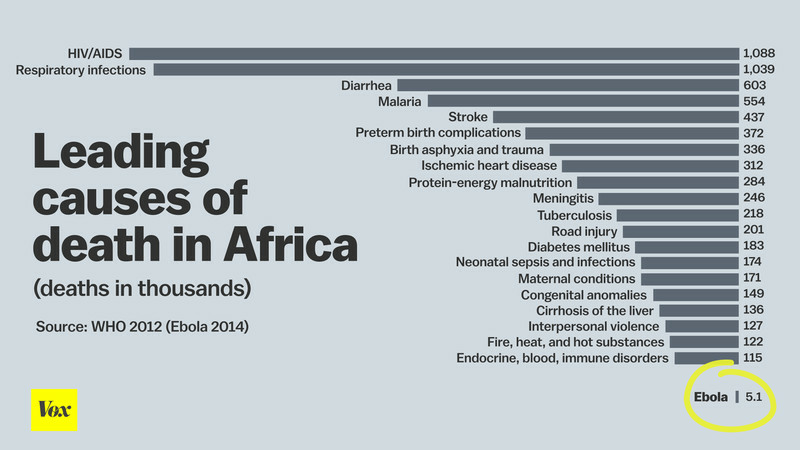 Despite a Vox graphic highlighting the very small impact on the continent as a whole, I recently saw an image outlining the relative impact of Ebola on monthly mortality in the three most-affected nations. The takeaway: at this point, it’s as/more serious as malaria in all three countries, and as HIV in Sierra Leone and Liberia. There was a small-ish set (80 patients with symptoms, 37 confirmed with Ebola) of clinical data reported by Elhadj Bah and colleagues from Conakry last week (Bah paper). The data provided on disease timings were in line with previous reports, although the mortality rate of 43% (a rate the authors see as still too high) was impressively low, possibly a result of aggressive hydration policies. I would also note that Maria Kiskowski‘s paper on network-structured epidemic spread, that I mentioned a few weeks ago, is now published in PLoS Currents Outbreaks. Go read it is its updated, formatted form. After the early concern about mutation of the Ebola virus for airborne transmissibility (spoiler alert: very unlikely), things went quiet for a while on the biological front. However, with the ramp up in searches for treatments and vaccines, there has been increasing interest in viral genetics and pathways. This is not an area I know much about; but I should do. So the material in this section may be a little simplistic for some of you, or a little more comprehensible than usual for others. Corrections and clarifications are welcome. Individual disease progression: Helen Branswell provides a tour-de-force overview of how the Ebola progresses through its human host. She highlights the importance of dose, age and genetic susceptibility in terms of clinical outcomes, but also how Ebola disables, misleads and co-opts our innate immune system. For a slightly more technical explanation of the same, Rachel Cotton posted a nice overview of Ebola’s immunopathology on PLoS Student Blog in June. And for something more detailed, here’s an extract and link to a more academic paper on how Ebola affects organs once lodged therein. Population genetics: There has been discussion in recent weeks about the absence of enough genetic samples to allow good analysis of how Ebola is changing over time. While data is now being brought together in central locations (e.g. UCSC’s Ebola Portal, described here), a debate is beginning to emerge over how fast the disease is evolving. Gire and colleagues had previously suggested rapid evolution. Using the same data, two papers this week come to very different conclusions. Marta Luksza and colleagues suggest that 3 distinct clades were present in the 78 genomes Gire et al used, and that the most recently arising clade has a higher reproductive number, potentially leading to it dominating the others within a few months (Luksza paper). Stephanie Spielman and colleagues, in contrast, suggest that Ebola is evolving only slowly – notably in comparison to historical influenza data – and that interpretations to the contrary may reflect methodological misunderstandings (Spielman paper). Again, not my field, but in the absence of any drug pressure from treatment, I would expect any evolution to be pretty neutral at present, certainly within patients. I’ll also flag the map of cumulative incidence by county on the Humanitarian Data Exchange’s Ebola page, which also has masses of (well, 41) links to datasets relating to the epidemic. 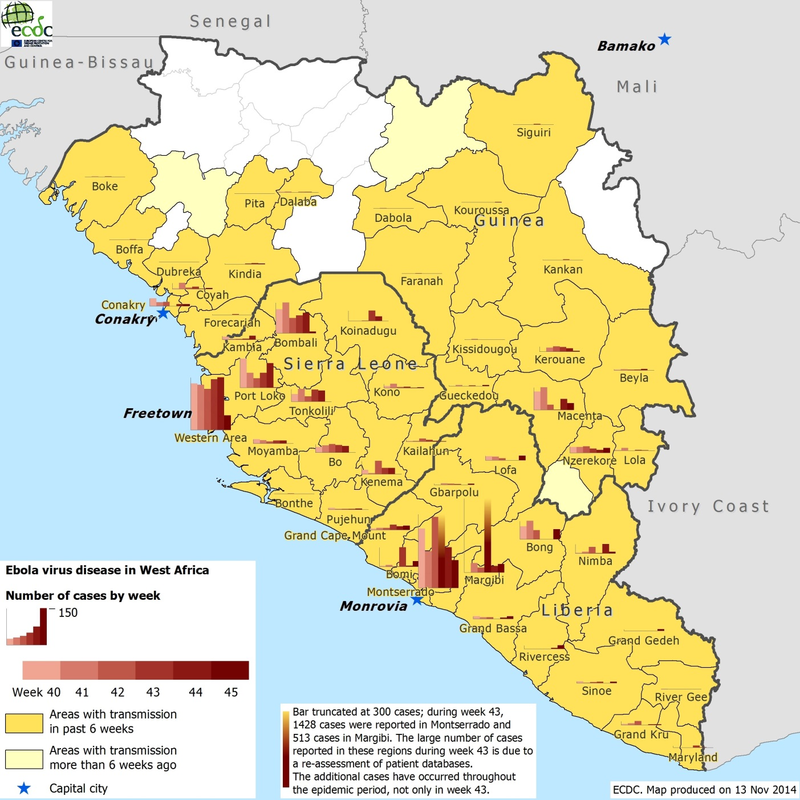 And what looks like a dynamic version of the standard Ebola map the WHO uses for their SitReps. Bah et al’s data from Conakry, combined with a qualitative assessment of clinical experience in Monrovia by Daniel Chertow and colleagues, seem to point to central importance of massive fluid loss (via diarrhoea, and eventually cell destruction) and shock in clinical management (Chertow paper). Avoidance or management of fluid loss appears to be central to improving outcomes, as was also highlighted in the Bah paper, and in a very different context by doctors at Emory hospital and elsewhere in the United States.2 Knowing what to do is one thing, achieving it quite another: as this NYT piece highlights, intensive care requires lots of staff, especially when they are all in PPE at >30 degree Celcius (and rising over the next couple of months). So the fix needed isn’t knowledge, it’s better ways to meet the known need. Nevertheless, if medications can be found that reduce the initial dehydration, that would be very helpful. On which front, the announcement by MSF that they will be hosting three treatment trials – using historical outcomes as the control group3 – is of interest. One trial will look at using serum (concentrated blood) from recovered patients, while the other two will use antivirals proven to help with influenza, pneumonia and other infections. Fingers crossed. And of course, care needs to extend well past the door of the Ebola Treatment Unit/Centre (ETU/ETC). As the latest infected doctor (who was not working at an ETU) was flown from Sierra Leone to the US for care, there was a piece in MMWR this week reminding us that the greatest risk for healthcare workers early in the epidemic arose from non-ETU settings, where PPE is not being routinely used. The setting of precautionary measures at Community Care Centres (i.e. where suspected or infected persons can be supported in the absence of ETU) is particularly worthy of attention. While all of the above is crucial to treating infected persons, there continues to be strong evidence that hospital treatment alone will not be sufficient to curtail an epidemic as generalized as the current one. John Drake and colleagues have a paper on the arXiv this week that uses a generational branching process approach and the construction of plausible parameter sets (as opposed to fitting the model to observed data). They find that anything short of rapid hospitalization of 85% of all cases will not get R0 under 1 any time soon. This is a very big/rather unlikely ask. Given the consistent finding that treatment alone is unlikely to end the epidemic rapidly, three strategies remain available: (1) change behaviour; (2) contain the at-risk population; (3) vaccinate widely. I’m afraid I don’t have much new news on (1) right now, although there was a nice article in the New Yorker on how media conversations around Ebola are being built. But here’s some recent thoughts on (2) and (3). Contact tracing appears to be quite possibly both the most important and the least-well executed part of the epidemic response to date. While much input from the CDC and others has provided an infrastructure for contact tracing, twitter sources I can’t immediately track down seem to suggest that on-the-ground effectiveness may be hamstrung by resource availability, client fear (perhaps by association with those who are working on Ebola) and possibly a lack of funds. Given Nigeria and the DRC’s successes in snuffing out outbreaks, comparisons are being made – with some attributing Nigeria’s success (their Re is estimated to have been below 1 within 15 days of the first case) to their experience in tackling polio, and many attributing the DRC’s to experience of past outbreaks. There are also descriptions of how case management proceeded in Dallas, TX and Ohio, after the 3-case outbreak in Dallas last month. However, it looks like the big problems are logistical and indeed sociological, rather than a knowledge-gap. In which case, it’s back to figuring out how to adapt existing models to local situations. There are many vaccine efforts underway, including safety trials in Germany/Switzerland/Gabon/Kenya and Mali. for the two most advanced candidates; there are many others in development.Trials will start late this year/early next year, probably initially in healthcare workers. I’m broadening this category out a little to cover anything that provides insight by drawing on human behaviour, or how Ebola draws out existing problems/opportunities within the affected communities. And for a lengthy, considered and involving read on this topic, I can strongly recommend Kathleen Alexander and colleagues’ pre-acceptance paper in PLoS Neglected Tropical Diseases (Alexander paper). After explaining how the biology of this outbreak looks much like earlier Ebola episodes, the authors consider many of the possible ways in which human behaviour, and its interaction with the environment (including fauna), might have made this event so serious. Topics covered include climate change and human landscape change (for initial zoonotic infection) and population density, human mobility, civil unrest, cultural practices (including burial and healthcare seeking behaviour), food consumption and fear. The article focuses on scope-of-inquiry than detailed examination of specific issues, but highlights the importance of examining a wide range of factors for understanding this epidemic, and for early detection of the next one. On the mobility front, there was an article this week out of CIDRAP, highlighting the potential for increased infection spread as seasonal migration from home farmlands to commercial employment sites begins post-rainy season. Another reminder of the importance of local knowledge in fighting the epidemic. And on a historical note, Mark Honigsbaum drew parallels last week between 19th century yellow fever and cholera outbreaks and the Ebola epidemic today. He highlights the fear of disease importation, the stigmatization of the sick and foreigners, and sacrifices of those who either chose or had not choice but to stay and help. A timely reminder. I’m rolling material on movement restrictions, aside from actual evidence of their effectiveness, into here since so much of this topic is about perceptions and communication. There’s an interesting conversation developing around what those with full information about the epidemic (i.e. who have really studied the evidence) should be saying. On one side are those who argue for a low-key reaction, based on fear that quarantines and travel bans will reduce our ability to respond to the epidemic and that such bans will lead to stigmatization and is being used for political ends. On anoother side are those who worry that a failure to highlight and act to prevent the possibility of severe (but maybe not as extreme as many think) scenarios, such as a widespread outbreak in the United States, is a significant failure of the part of the public health services. There may well be other sides I’m not seeing. My impression is that people are seeing roughly the same information but drawing rather different conclusions, perhaps based on their professional expertise, personal experiences and risk tolerance. But however heated the arguments, I’m glad to see the strong use of evidence on by all: a common language is the first prerequisite for a productive conversation. In this context, I read two very insightful articles this week. One by Lisa Rosenbaum in the NEJM noting that officials often prioritize certainty in their predictions (e.g. there’s no way there will be a large-scale outbreak in the US) for fear that expressions of doubt will be interpreted as a lack of expertise. Rosenbaum raises two key points: first, that conveying uncertainty can be reassuring if done carefully – too sure an assurance can sound like it is hiding the truth; and second, that it is crucial to sensitize the public to the reality that facts may change, and when they do, so will your message (and that this is not a sign of ignorance). The second wasn’t directly about Ebola, but reminded me that when it comes to changing beliefs, we cannot assume that everyone is simply an island. The paper by Aris Anagnostopoulos and colleagues looks at how misinformation is spread across a network (in this case Facebook), and shows the importance of homophily (Anagnostopoulos paper). As can be seen with measles outbreaks in the US, those who question public health messages are non-randomly distributed and tend to cluster together. Thus even when the great majority of people can be inoculated against disease – either through a vaccination or through sound advice – some groups will require special attention and quite possibly different messages to affect change. This came to mind when reading a report earlier today by Timothy Robertson relating to villagers in rural Guinea over the summer. The villagers could not be persuaded to allow health workers to enter the village for some weeks despite deaths from Ebola, due to circulating rumours of body snatching, a history of harm arriving from outside, and the absence of a trust relationship between HCW and villagers. The upshot was additional deaths, and then a new approach that allowed villagers to participate in burials by HCWs that began to build a relationship. We keep on learning. It’s been a quiet week or two for me on the generalist literature front. Laurie Garrett has been writing lots in Foreign Policy while visiting West Africa. Jina Moore‘s still there and also writing frequently. And I’d note that a prominent journalist David Tam Baryoh just spent 10 days in jail in Sierra Leone, purportedly for being a little too pointed about the government’s Ebola response. Guess our #hackebola idea really took off. Hearing of events in NY, MA, CA, DC, and abroad. Crazy! Specifically, I see a link to a hackathon in San Francisco this coming weekend. As well as data hacking, universities around North America have been thinking about engineering hacks, including coloured bleach for disinfection and more ergonomic PPE. Lots of ways of using whatever your skills might be to lend a hand. And there’s always donation if time is short. As ever, if you have seen something I’ve missed (or links are broken), you can reach me @harlingg. And as ever, thank you to all those whose tweets and posts I’m building this from. There are previous posts in this series: #1, #2, #3, #4, #5, #6; and a summary of data/research sources. 2 Inside baseball alert. Weitz and Dushoff also neatly show the importance of using a non-exponential incubation time, suggesting a multi-class gamma function instead. 3 On which topic, see this discussion in Nature on the discussion of the ethics of control groups in Ebola trials. This entry was posted in Ebola and tagged ebola, epidemic, epidemiology, roundup, west africa. Bookmark the permalink.